Richmond Docklands let a 2-0 lead slip against old rivals Malory Eagles and couldn’t recover to avoid a tough five-set loss. It was the 44th Docklands/Malory clash, a tie that dates back to 1996. Richmond Docklands don’t have long to wait for number 45 with a chance for revenge in two weeks time on March 16th at Kingston College Arena. The match will also be Docklands’ 500th competitive fixture. Coach Andy Hopper said after the match, “We played some great stuff in the first two sets and showed some real fighting spirit. We didn’t give up in the first set and stunned Malory to take the set. We then kept our momentum and there was always only going to be one winner in set two. It’s disappointing we couldn’t finish off the job but Malory made some subtle changes and we didn’t have the resources to make our own adjustments. I’m confident with a full squad in two weeks time we can turn it around”. At 2-0 down, ex-Docklands coach Ian Legrand made the bold decision to switch Corey Pieper from the opposite slot to outside hitter and mixed up his middles. Richmond Docklands failed to adapt and the extra energy on the Malory side of the net propelled the home side into a dominant 8-2 lead. Despite closing the gap Richmond had left themselves too much to do and Malory took set three 25-21. It was now Malory’s turn to maintain their momentum and led for most of set four to claim it 25-20. 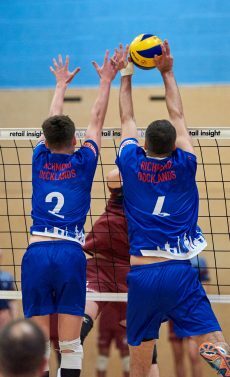 Richmond Docklands made a disastrous start in the fifth set shoot-out, going behind 4-0. Again the visitors left themselves too much to do and eventually went down 15-9. Despite the loss, Richmond Docklands remain top of the bottom half of the Super League and a win against Malory in two weeks would put them in control of the race for sixth place. On Sunday our NVL2 side hosted Cheltenham and after a tight first set (26-24) they came out comfortable 3-0 winners (sets 2/3 25-11 and 25-12).